You see the headlines every day. Hospital Hit with $237 Million Stark Law Judgment. Hospital Pays $389 Million in Anti-Kickback Case. 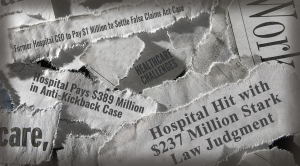 Former Hospital CEO to Pay $1 Million to Settle False Claims Act Case. Successful, well managed hospitals and health systems where rules and regulations became distorted. Violations by a few bad apples continue to increase scrutiny and risk for all hospitals regardless of the reputation you have built. You need to be more diligent than ever to ensure you are not unknowingly out of compliance. If you are not, the costs can be staggering. Additionally, the Medicare Fraud Strike Force and the Health Care Fraud Prevention and Enforcement Action Team (HEAT) recovered $1.9 billion from healthcare fraud cases. That does not include the millions paid to consumers and state Medicaid programs. Enter your information to download the infographic to discover the True Cost of Healthcare Compliance Violations and our recommendations you can use to help mitigate risk of Stark Law, Anti-Kickback Statute, and False Claims violations at your hospital.